The aim of this review is to present the characteristics of diseases associated with foveal hypoplasia and to present the OCT images and functional assessments in relation to the underlying genetics or development conditions. The diseases can be characterized by their frequency of foveal hypoplasia, the underlining genetic and nongenetic conditions, and the presence or absence of vision impairments [Table 1]. 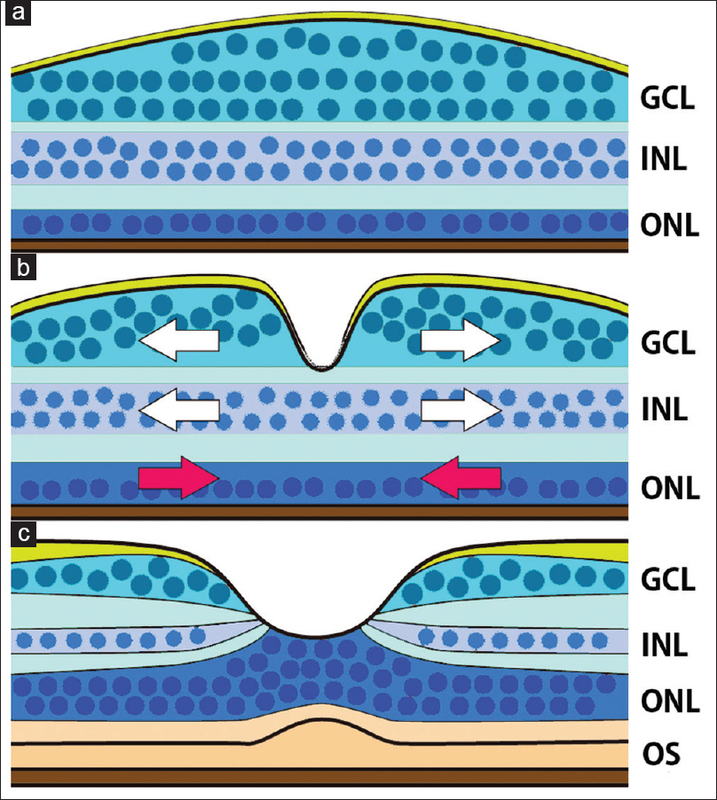 The development of the foveal pit involves the bidirectional movement of the neurons in the inner and outer retina [Figure 1]. The cells of the inner retina are displaced centrifugally to form the foveal pit, and the cone cells are displaced centripetally so that the density of cones in the foveal pit increases. Thomas et al. proposed a structural grading system of foveal hypoplasia based on the cross-sectional OCT images: Grade 1, a shallow foveal pit and presence of a thick outer nuclear layer (ONL) and presence of OSs in the foveal pit; Grade 2, absence of foveal pit; Grade 3, absence of OS lengthening; and Grade 4, absence of ONL widening. 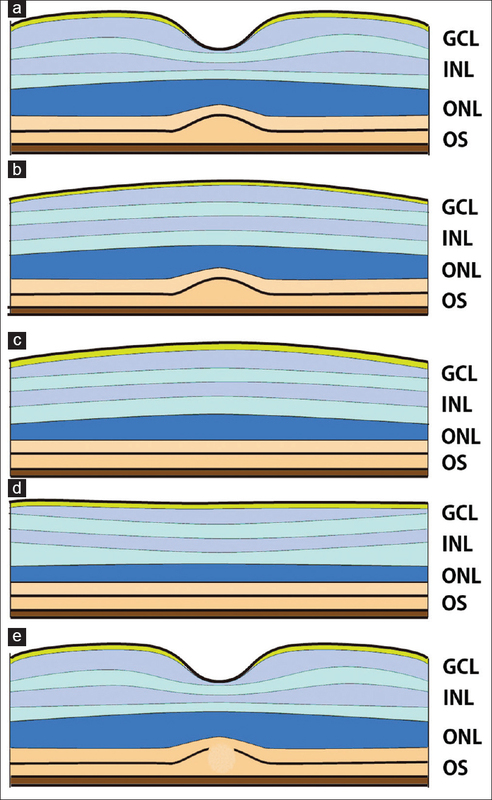 Grades 1 and 2 represent deficient foveal pit formation with intact cone specialization, while Grades 3 and 4 represent a failure of cone specialization [Figure 2]. With the advent of high-resolution OCT imaging, signs of foveal hypoplasia have been identified in eyes with achromatopsia, optic nerve hypoplasia, familial exudative vitreoretinopathy (FEVR), and Stickler syndrome. The signs are the persistence of the inner retinal layers as detected in the cross-sectional OCT images and reduced size of the FAZ by OCT angiography. In contrast to eyes with achromatopsia or optic nerve hypoplasia in which poor vision is essentially due to cone dysfunction or dysgenesis of retinal ganglion cells, eyes with FEVR and Stickler syndrome tend to have good visual acuities regardless of the severity of foveal pit malformation [Figure 3]. Duke-Elder S. System of Ophthalmology. Vol. 3. St. Louis: CV Mosby; 1963. Bringmann A, Syrbe S, Görner K, Kacza J, Francke M, Wiedemann P, et al. The primate fovea: Structure, function and development. Prog Retin Eye Res 2018. pii: S1350-9462(17) 30116-7. Curran RE, Robb RM. Isolated foveal hypoplasia. Arch Ophthalmol 1976;94:48-50. Mietz H, Green WR, Wolff SM, Abundo GP. Foveal hypoplasia in complete oculocutaneous albinism. A histopathologic study. Retina 1992;12:254-60. Hendrickson A, Possin D, Vajzovic L, Toth CA. Histologic development of the human fovea from midgestation to maturity. Am J Ophthalmol 2012;154:767-78. Vajzovic L, Hendrickson AE, O'Connell RV, Clark LA, Tran-Viet D, Possin D, et al. Maturation of the human fovea: Correlation of spectral-domain optical coherence tomography findings with histology. Am J Ophthalmol 2012;154:779-89 e2. Montoliu L, Grønskov K, Wei AH, Martínez-García M, Fernández A, Arveiler B, et al. Increasing the complexity: New genes and new types of albinism. Pigment Cell Melanoma Res 2014;27:11-8. Hirji N, Aboshiha J, Georgiou M, Bainbridge J, Michaelides M. Achromatopsia: Clinical features, molecular genetics, animal models and therapeutic options. Ophthalmic Genet 2018;39:149-57. Thiadens AA, Somervuo V, van den Born LI, Roosing S, van Schooneveld MJ, Kuijpers RW, et al. Progressive loss of cones in achromatopsia: An imaging study using spectral-domain optical coherence tomography. Invest Ophthalmol Vis Sci 2010;51:5952-7. Sundaram V, Wilde C, Aboshiha J, Cowing J, Han C, Langlo CS, et al. Retinal structure and function in achromatopsia: Implications for gene therapy. Ophthalmology 2014;121:234-45. Thomas MG, Kumar A, Kohl S, Proudlock FA, Gottlob I. High-resolution in vivo imaging in achromatopsia. Ophthalmology 2011;118:882-7. Chen CA, Yin J, Lewis RA, Schaaf CP. Genetic causes of optic nerve hypoplasia. J Med Genet 2017;54:441-9. Pilat A, Sibley D, McLean RJ, Proudlock FA, Gottlob I. High-resolution imaging of the optic nerve and retina in optic nerve hypoplasia. Ophthalmology 2015;122:1330-9. Katagiri S, Nishina S, Yokoi T, Mikami M, Nakayama Y, Tanaka M, et al. Retinal structure and function in eyes with optic nerve hypoplasia. Sci Rep 2017;7:42480. Kondo H. Complex genetics of familial exudative vitreoretinopathy and related pediatric retinal detachments. Taiwan J Ophthalmol 2015;5:56-62. Yonekawa Y, Thomas BJ, Drenser KA, Trese MT, Capone A Jr. Familial exudative vitreoretinopathy: Spectral-domain optical coherence tomography of the Vitreoretinal interface, retina, and choroid. Ophthalmology 2015;122:2270-7. Matsushita I, Nagata T, Hayashi T, Kimoto K, Kubota T, Ohji M, et al. Foveal hypoplasia in patients with stickler syndrome. Ophthalmology 2017;124:896-902. Hendrickson AE, Yuodelis C. The morphological development of the human fovea. Ophthalmology 1984;91:603-12. Linberg KA, Fisher SK. A burst of differentiation in the outer posterior retina of the eleven-week human fetus: An ultrastructural study. Vis Neurosci 1990;5:43-60. Provis JM, Dubis AM, Maddess T, Carroll J. Adaptation of the central retina for high acuity vision: Cones, the fovea and the avascular zone. Prog Retin Eye Res 2013;35:63-81. Springer AD, Hendrickson AE. Development of the primate area of high acuity 1. Use of finite element analysis models to identify mechanical variables affecting pit formation. Vis Neurosci 2004;21:53-62. Dubis AM, Hansen BR, Cooper RF, Beringer J, Dubra A, Carroll J, et al. Relationship between the foveal avascular zone and foveal pit morphology. Invest Ophthalmol Vis Sci 2012;53:1628-36. Gariano RF. Special features of human retinal angiogenesis. Eye (Lond) 2010;24:401-7. Balaratnasingam C, Chae B, Remmer MH, Gomez E, Suzuki M, Engelbert M, et al. The spatial profile of macular pigments is related to the topological characteristics of the foveal avascular zone. Invest Ophthalmol Vis Sci 2015;56:7859-65. Yuodelis C, Hendrickson A. A qualitative and quantitative analysis of the human fovea during development. Vision Res 1986;26:847-55. Provis JM, Sandercoe T, Hendrickson AE. Astrocytes and blood vessels define the foveal rim during primate retinal development. Invest Ophthalmol Vis Sci 2000;41:2827-36. Hendrickson AE. Primate foveal development: A microcosm of current questions in neurobiology. Invest Ophthalmol Vis Sci 1994;35:3129-33. Thomas MG, Kumar A, Mohammad S, Proudlock FA, Engle EC, Andrews C, et al. Structural grading of foveal hypoplasia using spectral-domain optical coherence tomography a predictor of visual acuity? Ophthalmology 2011;118:1653-60. Creel DJ, Summers CG, King RA. Visual anomalies associated with albinism. Ophthalmic Paediatr Genet 1990;11:193-200. Chong GT, Farsiu S, Freedman SF, Sarin N, Koreishi AF, Izatt JA, et al. Abnormal foveal morphology in ocular albinism imaged with spectral-domain optical coherence tomography. Arch Ophthalmol 2009;127:37-44. Harvey PS, King RA, Summers CG. Spectrum of foveal development in albinism detected with optical coherence tomography. J AAPOS 2006;10:237-42. Marmor MF, Choi SS, Zawadzki RJ, Werner JS. Visual insignificance of the foveal pit: Reassessment of foveal hypoplasia as fovea plana. Arch Ophthalmol 2008;126:907-13. McAllister JT, Dubis AM, Tait DM, Ostler S, Rha J, Stepien KE, et al. Arrested development: High-resolution imaging of foveal morphology in albinism. Vision Res 2010;50:810-7. Mohammad S, Gottlob I, Kumar A, Thomas M, Degg C, Sheth V, et al. The functional significance of foveal abnormalities in albinism measured using spectral-domain optical coherence tomography. Ophthalmology 2011;118:1645-52. Fulton AB, Albert DM, Craft JL. Human albinism. Light and electron microscopy study. Arch Ophthalmol 1978;96:305-10. Provis JM, Penfold PL, Cornish EE, Sandercoe TM, Madigan MC. Anatomy and development of the macula: Specialisation and the vulnerability to macular degeneration. Clin Exp Optom 2005;88:269-81. Rodanant N, Bartsch DU, Bessho K, Freeman WR. Autofluorescence image in ocular albinism. Retina 2003;23:265-6. Seo JH, Yu YS, Kim JH, Choung HK, Heo JW, Kim SJ, et al. Correlation of visual acuity with foveal hypoplasia grading by optical coherence tomography in albinism. Ophthalmology 2007;114:1547-51. Gehring WJ. The master control gene for morphogenesis and evolution of the eye. Genes Cells 1996;1:11-5. Abadi RV, Dickinson CM. Blue light hazard and aniridia. Br J Ophthalmol 1985;69:233-5. Yokoi T, Nishina S, Fukami M, Ogata T, Hosono K, Hotta Y, et al. Genotype-phenotype correlation of PAX6 gene mutations in aniridia. Hum Genome Var 2016;3:15052. Hingorani M, Williamson KA, Moore AT, van Heyningen V. Detailed ophthalmologic evaluation of 43 individuals with PAX6 mutations. Invest Ophthalmol Vis Sci 2009;50:2581-90. Katagiri S, Yokoi T, Mikami M, Nishina S, Azuma N. Outer retinal deformity detected by optical coherence tomography in eyes with foveal hypoplasia. Graefes Arch Clin Exp Ophthalmol 2016;254:2197-201. Azuma N, Nishina S, Yanagisawa H, Okuyama T, Yamada M. PAX6 missense mutation in isolated foveal hypoplasia. Nat Genet 1996;13:141-2. Chauhan BK, Yang Y, Cveklová K, Cvekl A. Functional properties of natural human PAX6 and PAX6(5a) mutants. Invest Ophthalmol Vis Sci 2004;45:385-92. Liu JY, Ren X, Yang X, Guo T, Yao Q, Li L, et al. Identification of a novel GPR143 mutation in a large Chinese family with congenital nystagmus as the most prominent and consistent manifestation. J Hum Genet 2007;52:565-70. Poulter JA, Al-Araimi M, Conte I, van Genderen MM, Sheridan E, Carr IM, et al. Recessive mutations in SLC38A8 cause foveal hypoplasia and optic nerve misrouting without albinism. Am J Hum Genet 2013;93:1143-50. Perez Y, Gradstein L, Flusser H, Markus B, Cohen I, Langer Y, et al. Isolated foveal hypoplasia with secondary nystagmus and low vision is associated with a homozygous SLC38A8 mutation. Eur J Hum Genet 2014;22:703-6. Toral MA, Velez G, Boudreault K, Schaefer KA, Xu Y, Saffra N, et al. Structural modeling of a novel SLC38A8 mutation that causes foveal hypoplasia. Mol Genet Genomic Med 2017;5:202-9. Lutty GA, Chan-Ling T, Phelps DL, Adamis AP, Berns KI, Chan CK, et al. Proceedings of the third international symposium on retinopathy of prematurity: An update on ROP from the lab to the nursery (November 2003, anaheim, california). Mol Vis 2006;12:532-80. Isenberg SJ. Macular development in the premature infant. Am J Ophthalmol 1986;101:74-80. Mintz-Hittner HA, Knight-Nanan DM, Satriano DR, Kretzer FL. A small foveal avascular zone may be an historic mark of prematurity. Ophthalmology 1999;106:1409-13. Maldonado RS, O'Connell RV, Sarin N, Freedman SF, Wallace DK, Cotten CM, et al. Dynamics of human foveal development after premature birth. Ophthalmology 2011;118:2315-25. Recchia FM, Recchia CC. Foveal dysplasia evident by optical coherence tomography in patients with a history of retinopathy of prematurity. Retina 2007;27:1221-6. Wu WC, Lin RI, Shih CP, Wang NK, Chen YP, Chao AN, et al. Visual acuity, optical components, and macular abnormalities in patients with a history of retinopathy of prematurity. Ophthalmology 2012;119:1907-16. Villegas VM, Capó H, Cavuoto K, McKeown CA, Berrocal AM. Foveal structure-function correlation in children with history of retinopathy of prematurity. Am J Ophthalmol 2014;158:508-12. Bernstein PS, Sharifzadeh M, Liu A, Ermakov I, Nelson K, Sheng X, et al. Blue-light reflectance imaging of macular pigment in infants and children. Invest Ophthalmol Vis Sci 2013;54:4034-40. Falavarjani KG, Iafe NA, Velez FG, Schwartz SD, Sadda SR, Sarraf D, et al. Optical coherence tomography angiography of the fovea in children born preterm. Retina 2017;37:2289-94. Nonobe N, Kaneko H, Ito Y, Takayama K, Kataoka K, Tsunekawa T, et al. Optical coherence tomography angiography of the foveal avascular zone in children with a history of treatment-requiring retinopathy of prematurity. Retina 2017. [Ahead of print]. doi: 10.1097/IAE.0000000000001937. Aradhya S, Woffendin H, Jakins T, Bardaro T, Esposito T, Smahi A, et al. Arecurrent deletion in the ubiquitously expressed NEMO (IKK-gamma) gene accounts for the vast majority of incontinentia pigmenti mutations. Hum Mol Genet 2001;10:2171-9. Goldberg MF. The blinding mechanisms of incontinentia pigmenti. Ophthalmic Genet 1994;15:69-76. Swinney CC, Han DP, Karth PA. Incontinentia pigmenti: A Comprehensive review and update. Ophthalmic Surg Lasers Imaging Retina 2015;46:650-7. Basilius J, Young MP, Michaelis TC, Hobbs R, Jenkins G, Hartnett ME, et al. Structural abnormalities of the inner macula in incontinentia pigmenti. JAMA Ophthalmol 2015;133:1067-72. Langlo CS, Patterson EJ, Higgins BP, Summerfelt P, Razeen MM, Erker LR, et al. Residual foveal cone structure in CNGB3-associated achromatopsia. Invest Ophthalmol Vis Sci 2016;57:3984-95. Matet A, Kohl S, Baumann B, Antonio A, Mohand-Said S, Sahel JA, et al. Multimodal imaging including semiquantitative short-wavelength and near-infrared autofluorescence in achromatopsia. Sci Rep 2018;8:5665. Greenberg JP, Sherman J, Zweifel SA, Chen RW, Duncker T, Kohl S, et al. Spectral-domain optical coherence tomography staging and autofluorescence imaging in achromatopsia. JAMA Ophthalmol 2014;132:437-45. Mosier MA, Lieberman MF, Green WR, Knox DL. Hypoplasia of the optic nerve. Arch Ophthalmol 1978;96:1437-42. Azuma N, Yamaguchi Y, Handa H, Tadokoro K, Asaka A, Kawase E, et al. Mutations of the PAX6 gene detected in patients with a variety of optic-nerve malformations. Am J Hum Genet 2003;72:1565-70. Higashide T, Wada T, Sakurai M, Yokoyama H, Sugiyama K. Macular abnormalities and optic disk anomaly associated with a new PAX2 missense mutation. Am J Ophthalmol 2005;139:203-5. Donoso LA, Edwards AO, Frost AT, Ritter R 3rd, Ahmad N, Vrabec T, et al. Clinical variability of stickler syndrome: Role of exon 2 of the collagen COL2A1 gene. Surv Ophthalmol 2003;48:191-203.